Smerinthus tatarinovii Bremer & Grey, 1853, in Motschulsky (ed. ), Etudes ent. 1: 62. 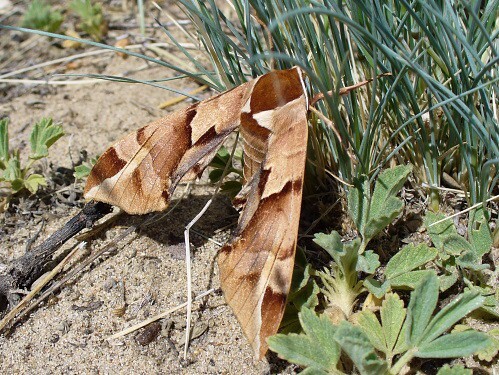 Type locality: [China,] Peking [Beijing] area. Synonym. Smerinthus tatarinovii Bremer & Grey, 1853. Synonym. Smerinthus eversmanni Eversmann, 1854, Bull. Soc. Imp. Nat. Moscou 27(2): 182, pl. 2, fig. 5. Synonym. Callambulyx tatarinovii coreana Gehlen, 1941. Note: Recent barcode studies suggest that Callambulyx tatarinovii is somewhat polymorphic in shape and size, and is probably derived from three refuge populations which diverged to some extent during the last ice age. Individuals from northeastern China and southern Russia tend to be smaller, with shorter, broader wings. As one proceeds south towards Guangdong, more and more individuals with longer and narrower wings appear in the population. In northwestern China and southern Russia Smerinthus tatarinovii f. eversmanni is sufficiently distinct enough genetically for some taxonomists to accord it full subspecific status; however, individuals of this race, which can have both green or brown forms, can be found eastwards across southern Siberia to the Russian Far East. In the male genitalia, uncus narrow and evenly tapered. Gnathos reduced, lacking medial lobe. Valva not broadly spatulate, instead a slender lobe but apically rounded or bluntly pointed; costal process is a broad, setose lobe. Harpe similar to that of Callambulyx rubricosa and Callambulyx poecilus and with two distal, pointed processes. Aedeagus with a narrow dentate flap-like prolongation, which is inverted when vesica is retracted. 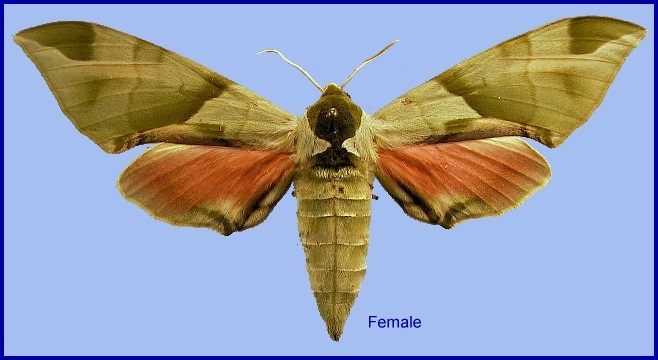 In the female genitalia, sterigma distinctive, in form of a long triangular lobe ending in two points and situated anterior to the ostium bursae. 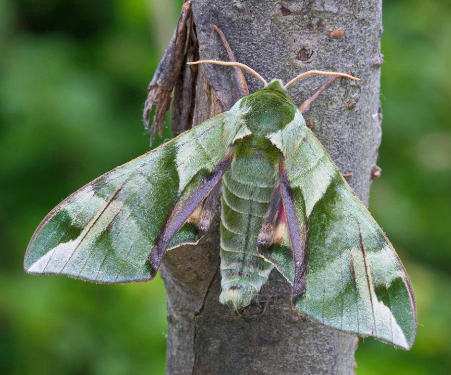 In the Russian Far East, where it frequents both coniferous and deciduous woodland, females are active between 22.20h and 00.40h, and males from 22.40h until 0230h (Izerskiy, 1999b). In China, there can be one or two generations a year, depending upon latitude. China: iv (Guizhou); 18.v (Shaanxi, near Binzhou); 26.v (Beijing, Baihua Shan); vi (Jinan; Jilin); 11.vi (Hebei); 15.vi-25.vii (Xinjiang, Shihezi); vi-vii (Nei Mongol, Great Khingan Mountains); vi-vii (Harbin; Liaoling); vii (Nei Mongol, Great Khingan Mountains; Heilongjiang; Liaoning); 21.vii (Shaanxi); ix (Shaanxi). Mongolia: 20.vii (Prikhingan'e). North Korea: 15-29.v (Chonma-san); vi (Hamhung; Pukchong; Mt. Kuwol; Sinmi-do; Muhak-san, Kilju City); vii (Baekdu-san). South Korea: 20-28.vi (Ulleung-do); vii (Ori-Dong). Russia: 3-28.vi (Primorskiy Kray; Buryatia; Transbaikalia); vi-vii (Amurskaya); 2-27.vii (Primorskiy Kray; Buryatia); vii-viii (Primorskiy Kray); 9.viii (Buryatia). The three specimens from Shihezi, Xinjiang, bear the dates 15.vi.1982, 12.vii.1982 and 25.vii.1983. Farther east in China this species is double-brooded and it may also be so in Xinjiang. Park et al. (1999) give early May until mid October as the flight period in Korea. OVUM: Oval, 1.35 x 2.03mm. Very similar to that of Smerinthus ocellata. LARVA: Full-fed 60--80mm. Early instars undescribed. 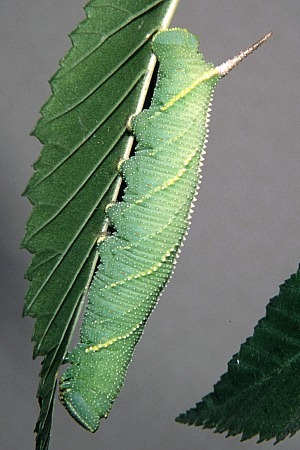 The mature larva is very like that of Smerinthus ocellata, except that it has a very noticable narrow cream dorsal line and alternate bold and faint oblique lateral stripes. The horn is almost straight and reddish. 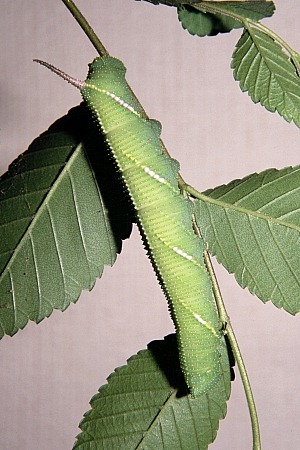 In eastern China, full-grown larvae are usually met with between June and July (Chu et al., 1979); however, full-grown larvae are also common in the suburbs of Beijing in late August, particularly on weeping varieties of Ulmus pumilus (Pittaway, pers. obs. 2003). PUPA: 34--41mm. Dark mahogany brown and slightly glossy; tapering caudad from a blunt head and thorax. 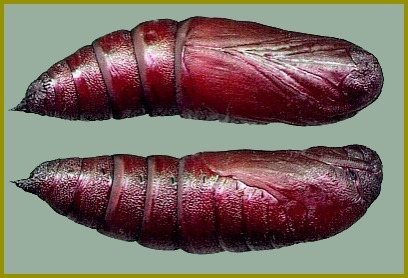 Proboscis not present, but replaced by a knob-like tubercle. 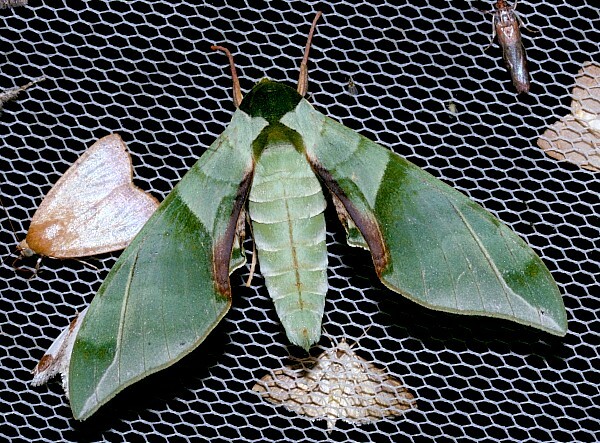 Wings and abdominal segments finely punctate. Cremaster broadly conical, with a sharp point; tuberculate. Similar to that of Smerinthus ocellata, but less glossy. Formed in an almost silk-free cell in the soil. The overwintering stage. Larval hostplants. Recorded in Guangdong on Ulmus parvifolius (Mell, 1922b), and in northern China on Zelkova (Yang, 1978) and Ulmus pumilus. Most other larval hostplant records from elsewhere within the range of Callambulyx tatarinovii are also Ulmaceae. 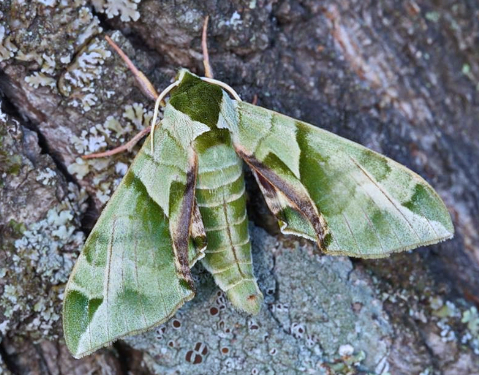 However, Yang (1978) also listed Euonymus alatus, Salix and Populus, while Xiao (1992) stated that Callambulyx tatarinovii is an occasional pest of the last of these. These, plus a single record from Prunus persica (Chang, 1989), require confirmation. 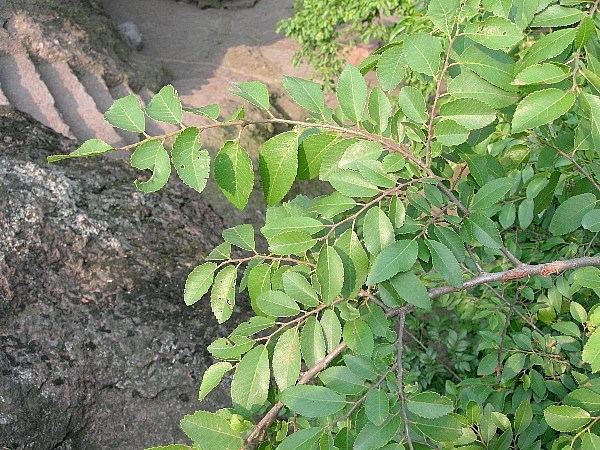 Recorded in Korea on Ulmus davidiana var. japonica, Zelkova serrata, Tilia amurensis and Euonymus sieboldianus (Park et al., 1999). 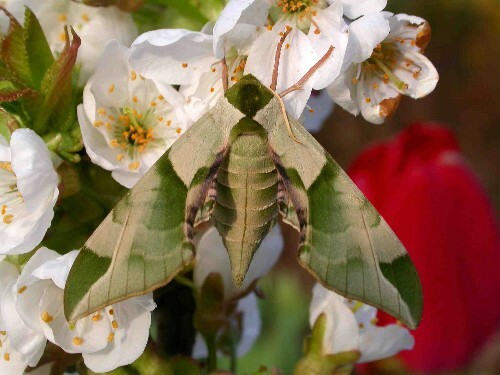 The record of Euonymus supports the claim that this host is used in China. Izerskiy (1999b) gives Ulmus japonica for the Russian Far East. The main host in Buryatia, Russia, is Ulmus pumilus (Gordeeva & Gordeev, 2011). China: Xinjiang (Shihezi); Nei Mongol (Great Khingan Mountains, Zalantun/Butha Qi, 1100-2000m; Chifeng/Ulanhad, Daguangdingzishan, 2061m; Ongniud Qi; Urad Houqi; Hulunbuir Region, Sanhaodian); Heilongjiang (Harbin; Lalin; Lesser Khingan Mountains, Fengling Forest); Jilin (Jiaohe, Lafa Shan); Liaoning (Changhai, Dachangshan Island); Hebei (Chengde); Beijing (Haidian; Baihua Shan); Tianjin; Shandong (Jinan; Beidaihe; Weihai); Shanxi (Taiyuan; Taigu; Qixian; Xiaxian; Pingyao; Jiexiu); Shaanxi (Louguantai Forest Park; Xunyang, 1380m; Dafosi Grotto, near Binzhou, 870m); Ningxia; Henan; Anhui (Mt. Huang Shan); Shanghai; Zhejiang (Tianmu Shan); Hubei (Xianfeng); Sichuan (Kangding; Xichang); Hunan (Shangzhi; Wuling Mountains); Fujian (Longqi Shan); ?Xizang/Tibet (Mutu, Namjagbarwa region, 850m; Nyingchi, 3070m); Guizhou (Jiucai Ling). Previously, this subspecies was known from the eastern half of China, as far south and west as Sichuan, Hunan and Fujian. The above records from near the China-Kazakhstan border (Shihezi) (SACS) represent a considerable westward extension to the known range of this eastern Palaearctic species. This is probably a result of the extensive planting of Ulmus trees across northern China, forming a habitable corridor that Callambulyx tatarinovii tatarinovii has exploited (Smerinthus planus planus (q.v.) has also reached the same area by a similar means). 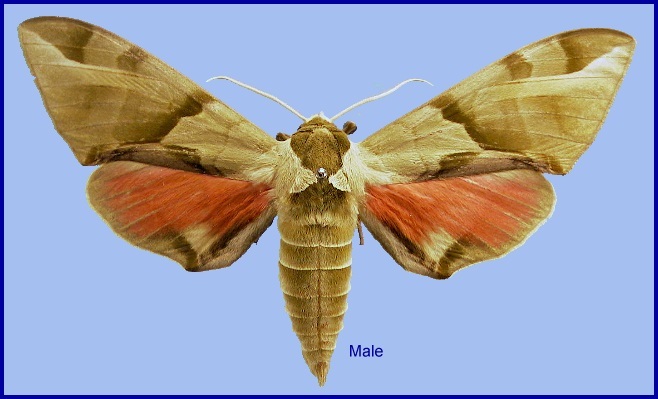 Mell (1958) noted that the larval hostplant of Callambulyx tatarinovii tatarinovii, Ulmus parvifolius, did not occur south of about 24°N in northern Guangdong and he never found this hawkmoth in the south of that province (Mell 1922b, 1958). Hence, we consider that the record of Callambulyx tatarinovii from Hainan (Yang, 1978) is a misidentification of Callambulyx rubricosa rubricosa or Callambulyx diehli Brechlin & Kitching, 2012. This may also be true of lowland Tibetan records (Wang, 1988), which may turn out be a northern population of Callambulyx diehli. However, Zhang et al. (1986) illustrated a typical Callambulyx tatarinovii tatarinovii from 3070m at Nyinchi, and thus Callambulyx tatarinovii may indeed extend southwest at high altitudes from Sichuan to Xizang/Tibet. This requires further study. Mongolia: Hövsgöl Prov. (Mörön); Dornod Prov. (Prikhingan'e). North Korea: South Hwanghae Prov. (Mt. Kuwol, 950m); North Pyongan Prov. (Myohyang-san; Sinmi-do; Chonma-san); South Hamgyong Prov. (Seokwang Temple; Hamhung; Gyungsung; Pulgaemi ridge above Pukchong City, 1500m); North Hamgyong Prov. (Baekdu-san, 2500m; Charyung; Muhak-san, Kilju City). South Korea: Baengnyeong-do & Daecheong-do; Seoul; Kyonggi Prov. ; Kangwon Prov. ; North Chungchong Prov. ; South Chungchong Prov. ; North Cholla Prov. ; South Cholla Prov. ; North Kyongsang Prov. (Ulleung-do); South Kyongsang Prov. ; Cheju Prov. 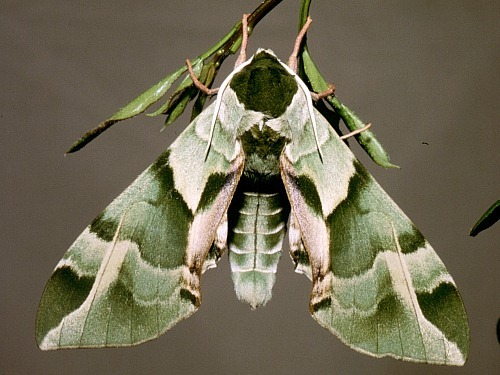 Russia: Siberia (Lake Baikal (Slydyanka)); Buryatia (Kyachta; Kokorino; Ulan-Ude; Selenduma; Onokhoy village; Selenga River valley; Taezhnyi; Tapkhar; Kokorino; Dodo-Enkhor); Transbaikalia (Ust'-Urlak on the Chikoy River); Amurskaya (Belogorsk; Blagoveshchensk; Uril); Yevreyskaya (Pompeyevka; Radde; Bastak); Khabarovskiy Kray (Khabarovsk; Slavyanka; Komsomolsk-na-Amure; Pivan); Primorskiy Kray (Barabash; Jankowski Peninsula; Primorskiy; Khasan; Andreevka; Vityaz Bay; Kedrovaya Pad Nature Reserve; Ussuriysk; Novovladimirovka; near Kalinovka; near Zanadvorovka; Anisimovka; Krounovka). From northern Xinjiang across northern China, Mongolia, southern Siberia/Transbaikalia (Chistyakov, 1988; Sergei Rybalkin, pers. comm. ; Gordeeva & Gordeev, 2011) to the Russian Far East, and then south through Korea (Kim et al., 1982; Park et al., 2014) and central China to, maybe, eastern Xizang/Tibet. Holarctic; eastern Palaearctic region. Pleistocene refuge: Monocentric -- Manchurian refuge.